Here I am at the Joomla World Conference in beautiful Rome from November 17-19 2017. This year I’m inviting everyone to give their opinion about what Joomla should be doing different or how the Joomla project should be run. On Saturday, March 14, 2015 I did a presentation called "Joomla Entanglement - How to Leverage Your Influence” at JoomlaDay Boston in Boston, Massachusetts. I invited the people in my session to give their opinion about what Joomla! should be doing different or how the Joomla! project should be run. On Friday November 8, 2013 I did a presentation called SEO From a Client Perspective” at the Joomla! World Conference 2013 in Boston, Massachusetts. I invited the people in my session to give their opinion about what Joomla! should be doing different or how the Joomla! project should be run. I started this page just prior to a presentation I did in 2013 called "Joomla! Truisms" at JandBeyond and we got some great opinions and feedback here. This page is like a suggestion box for Joomla! where you can see what is on the minds of others. You may discover that you have things in common with Joomlers and they may also rally around your great ideas for changing Joomla. 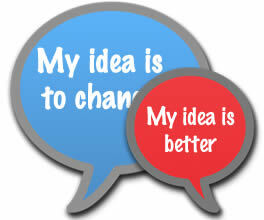 What would you change about Joomla! if you had total authority over the project? Gather your thoughts and then post them in the comments. Comments are moderated. I won't post spam, personal attacks, or obscenities. We all have an opinion, yours just may be the one that sparks the next greatest idea or changes the future direction of Joomla.